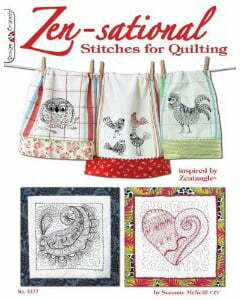 This December 2011 release, Zen-sational Stitches for Quilting, is another of CZT® Suzanne McNeill’s Zentangle®-inspired crafts series. Each of these booklets focuses on a different technique or medium to expand your Zentangle® creativity. My review is coming soon but this book is now available on Amazon, so if you have a quilter on your gifting list this might just be the book for them.